The Canada Basketball National Championships are coming up August 6–11 for the U15 and U17 Girls in Fredericton and the U15 and U17 Boys in Kamloops, B.C. All four teams are aiming for the top of the podium after the U15 Boys and Girls won gold at Nationals last summer and the U17 Boys finished first and the U17 Girls placed second at the 2017 Canada Summer Games. These four teams were not the only provincial squads hard at work this summer. The U14 Girls development team, which was established last summer to prepare young athletes to play at the provincial level, trained and competed alongside the U15 Girls at training camps around the province and at tournaments in Canada and the United States. Each training camp had a specific focus built on the one before it. The coaching staff planned out each practice to add on to previous learnings and to also challenge the athletes with new concepts. The players rose to the challenge every time, responding with grit and determination. On the competition side, the team finished the summer with a 7-7 record overall from three tournaments. Team Ontario started off strong with a perfect 4-0 record at the SLAM CAMP Summer Challenge in Montreal on June 30 and July 1. At the Nike Tournament of Champions in Chicago the following week, the team faced their first losses and finished the tournament 1-4. The U14 Girls wrapped up their summer at the end of July at the United States Junior Nationals (USJN) National Championships in Washington, D.C. Although the team finished with a 2-3 record, Head Coach Jobina D’Aloisio was pleased with the team’s performance. 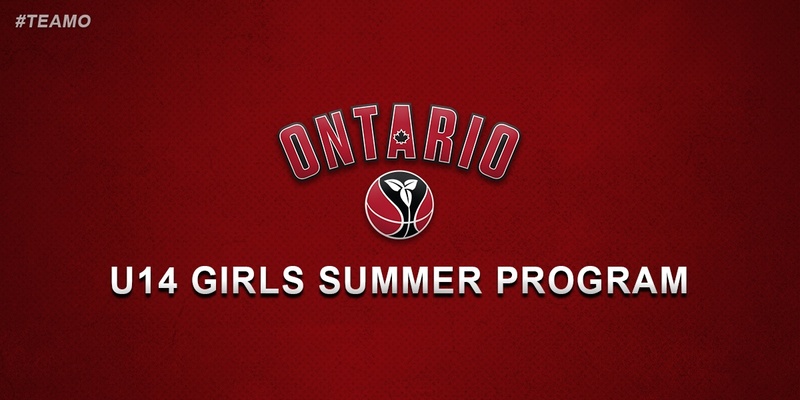 Ontario Basketball congratulates the U14 Girls Team Ontario on their accomplishments this summer. #GetToKnowTeamO with profiles of the U15 and U17 athletes on Ontario Basketball’s Twitter, Instagram, and Facebook, and check out their rosters for Nationals: U15 Girls roster, U17 Girls roster, U15 Boys roster, and U17 Boys roster. For the U14 team, put faces to the names with U14 Girls photos on Facebook. Stand by for a spotlight tomorrow on the final Team Ontario squad, the U14 Boys. Written on 2018-08-03, in News.